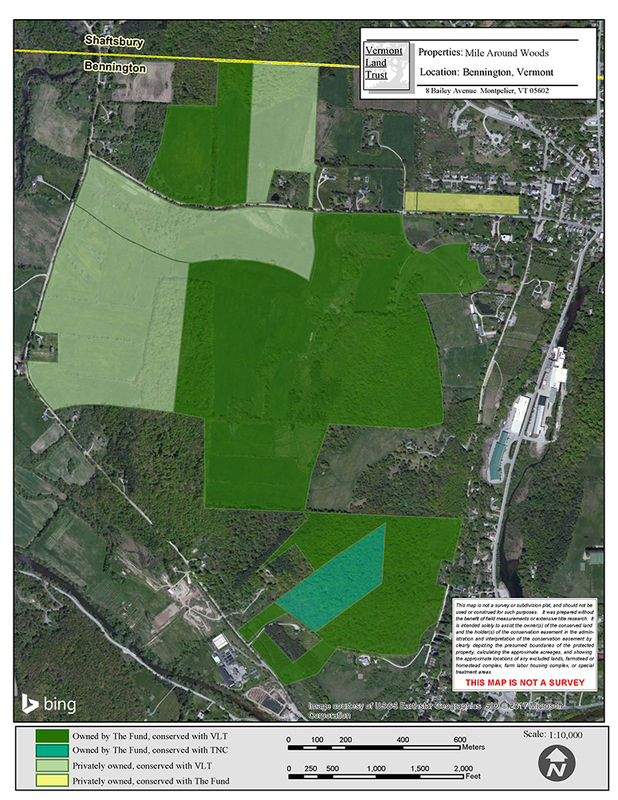 The Fund for North Bennington, Inc. owns 423 acres of field and farmland. The lands around The Mile-Around Woods and west of the village of North Bennington are currently posted against any hunting, with the exceptions discussed below. 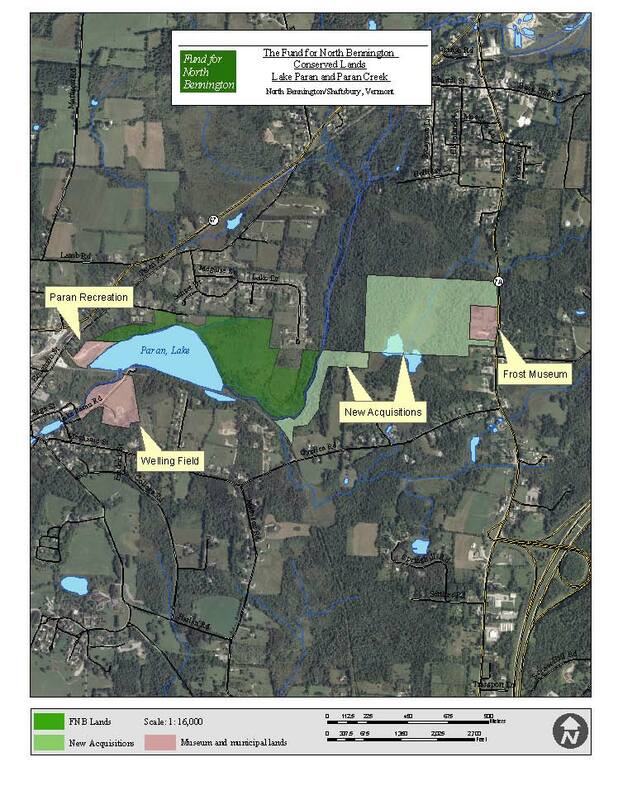 The lands around Lake Paran and The Robert Frost Trail are currently open to hunting. The Paran lands have never been posted. Hunting pressure there is generally quite light, and to date we have not been advised of any significant conflicts between hunters and persons walking on the trails. The lands around The Mile-Around Woodsare generally closed to hunting because of the intensity of public use. However, there has been a long history of illegal hunting along the western boundaries of these parcels. People using the fields and woods south and west of The Mile-Around Woods should be alert to the possibility of hunters in the vicinity. The Fund for North Bennington, Inc. has in some years granted written permission to several individuals to bow hunt for deer in these fields and woods (except for The Mile-Around Woods, which is closed to all hunters). All persons walking in Vermont woods, from October through December, should wear bright clothing and be careful to control their dogs. We have authorized limited hunting from time to time for two principal reasons. First, the deer population has become exceptionally high. There are rich food sources associated with the agricultural uses of the fields. The mixture of woods and open lands, and the total size of the conserved parcel, make this very attractive habitat to deer. Nibbling of saplings deters the establishment of new trees above the browse line. Without an adequate stock of saplings in the forest, canopy trees are not replaced when they die. Deer feeding also decreases plant diversity. Both the lack of tree regeneration and loss of diversity threaten the long-term health of the overall forest ecosystem. Finally, the health of the deer herd is compromised by over-population density. Second, the persistent problem of illegal hunting creates safety concerns. The presence of a small number of authorized hunters will not stop all illegal hunting, but can reasonably be expected to deter forays by rogue hunters on to these lands. Notices may be posted at trail heads to give additional information. In any event, always dress appropriately and take suitable precautions when walking in Vermont woods during the fall. If you witness unsafe conditions on property owned by The Fund for North Bennington, Inc., or have particular concerns or questions about these policies, please contact us.